Among existing theoretical models for the h-index, Hirsch’s original formula, the Egghe-Rousseau model and the Glänzel-Schubert model are the three main representatives. I acknowledge NSFC Grants (number 70773101 and number 7101017006) and am grateful to Dr. Ronald Rousseau for his comments. This chapter began in China and was completed in Germany, I thank financial support from Humboldt University and conditions provided by Prof. Stefan Hornbostel, Dr. Sybille Hinze and iFQ colleagues. This chapter is integrated and revised by merging two published papers: (1) Ye, F. Y. 2009. 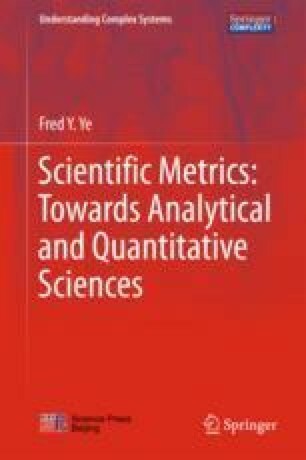 An investigation on mathematical models of the h-index. Scientometrics, 81 (2): 493–498; (2) Ye, F. Y. 2011. A unification of three models for the h-index. Journal of the American Society for Information Science and Technology, 62(1): 205–207.